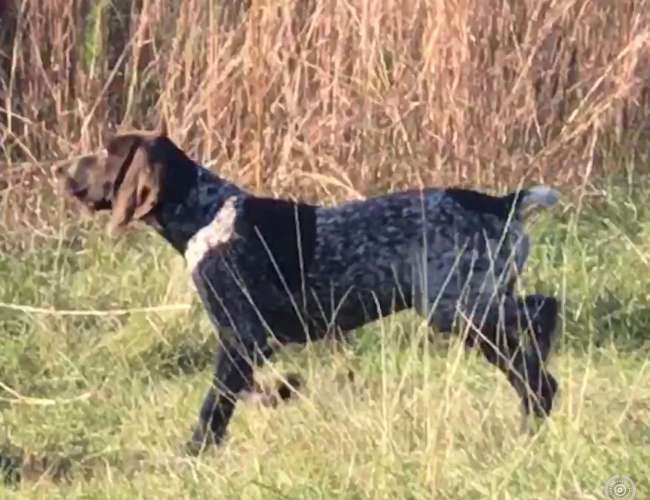 AKC German Shorthaired Pointer Male Puppy. Liver roam. Great conformation.15 Weeks Old. Pointing Wings & retrieving. Sire is Flyns Cuz Mihailo. Cuz is out of Bonas Kennel with German import breeding of European championship bloodlines. Dam is Sandy Ridge Ellie Mae. Ellie is personal hunting dog, excellent bird finder/retriever and granddaughter of 3x National Champion & 16x NSTRA Champion Crosswind Trucking Fritz and 4x NSTRA Champion Babes Running Wild. Tails have been docked and dew claws removed. Puppies are up to date on shots, been wormed at regular internals and have been vet checked. $700. 601-297-6538.